In recent months and years, there has been quite some discussion about the expansion of the Panama Canal and its implications for tradeflows. 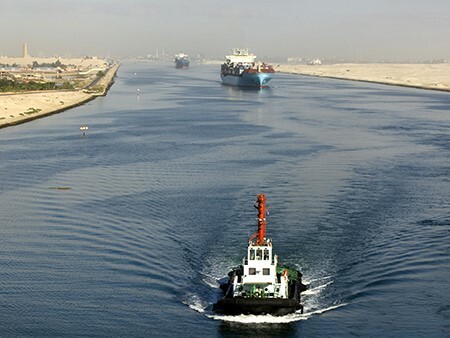 However, a similar capacity expansion of the Suez Canal that will be inaugurated in August of this year has received much less attention, according to Poten & Partners. The Suez Canal expansion, which was first announced in August 2014, will allow more two way traffic by adding a 35 km canal next to the existing one and by widening the Great Bitter Lakes by-passes and the Ballah by-pass with a total length of 37 km (the total length of the project is 72 km). This will double the capacity of the canal from about 49 ships per day to 97 ships and reduce transit and waiting time. Additionally, the objective is to increase the permissible draft to 66 ft (24 m) for the entire canal. The first ships should be able to pass through the new sections shortly after the inauguration. The project is expected to cost $8.5 billion and was financed by bonds issued to the Egyptian population. In 2014, the canal generated $5.5 Bln in revenue, which the government hopes to increase to $13.5 Bln by 2023. As the Suez Canal does not have locks, the expansion is simpler and can be done significantly faster than the Panama canal expansion. The project has a very aggressive timeline of 12 months. Currently, the canal is almost exclusively used for one way traffic that moves in convoy, either North–South or vice versa with two small areas where the convoys meet and south bound vessels need to wait for north bound vessels to pass. The new section will allow for two-way traffic over about half of the total length of the canal, reducing the transit time from 18 hours to 11 hours and reducing the maximum waiting time to enter the canal from 8-11 hours to three hours. If more tankers can pass through the Suez Canal, tonnage can be used more efficiently. A trip from Ras Tanura to LOOP is 12,300 miles (39 days at 13 knots) around the cape and 9,600 through the canal (31 days + 1 day for canal passage), representing savings of about 20%. The savings for voyages to NW Europe are even more significant: about 40%. The actual usage of the Suez Canal will be determined by the transit tolls, and the Egyptian authorities have not yet disclosed how they will manage the scheduling and pricing going forward. In any case, the expanded capacity allows the Canal Authorities to increase revenue by encouraging more tanker owners and charterers to use the canal rather than sail around the Cape. Tankers have the flexibility to immediately take advantage of the expanded canal capacity. 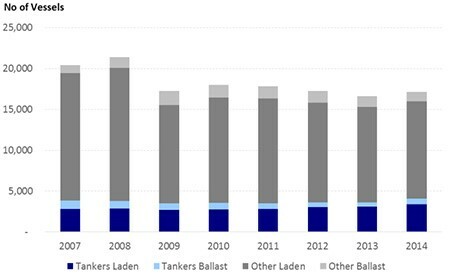 While crude oil flows from the Arabian Gulf to Europe and the United States have been under pressure, there is significant potential for additional product tanker transits through the Suez Canal as a result of the expanded export capacity of refiners in the Middle East.